No-man's land between Kyrgyzstan and Tajikistan. This is taken at over 4000 meters altitude - the second highest border crossing in the world. During my trip to the Pamir I maintained a long-hand journal in addition to my regular note-taking. My original intention was to use the work as a reference for later writing, but in reading back, it seems - for all its faults - worthwhile reproducing it verbatim. Annotated in parts, it more or less provides a direct window into my immediate thoughts while gallivanting around what is, without question, the most spectacular slice of earth I’ve traveled. The Wall. Looking towards the Tajik border from Sary Tash, Kyrgyzstan. A frantic start in Osh racing around to print my [Tajikistan] e-visa. Found the jeep, owned by a man name Omar. We went around picking up other passengers - two young women, one with a baby and dressed in tradional clothes. Many smiles. [A family member bidding them farewell] offered food through the open window. I drift in and out of sleep for the first few hours of the drive, before waking to soaring mountains near Sary Tash - a town which sits at 3,800 meters. I was stunned by the scene ahead of Sary Tash - an impenetrable wall of 7000 meter peaks. Jagged and covered in thick snow. They looked [similar to] The Wall in Game of Thrones. I rolled off my shutter towards the behemoth. Driving closer to the wall, the plateu was lush and green, littered with nomadic peoples, livestock, and yurts. A group of children flagged down the car seeming panicked. We stopped. They asked for lollies and food. The whole car laughed. The 7000 meter peaks drew closer, the border was near. To live and work at the Kyrgyz-Tajik border must be a unique misery. 2 truly desolate outposts - separated by an hour of no-mans land - sit alone in the mountains. The road between borders was ruinous - utterly destroyed. 2 poor cyclists attempted to ride throuh the mud and snow. Both borders were logistically easy. The Tajik post looks like something from a movi: no digital technology, only logbooks, pens and paper. There, we sat at 4,250 meters. We continued past the village and spectacular lake of Karakul [note: we paused here for an hour or so. It was one of the most stubbornly isolated human habitations I’ve laid eyes on]. The mountains continued, then we drove through the dead of night to Raikul, a tiny town near the Chinese border. There, we dined. I made the cardinal sin of entering the property with my shoes on, and was scolded by Rashid, the home owner. “Come on! This is my house!”, he said in English. I noticed that the women were being totally deferential to the men. They stand when the men enter the room, they let the men pass first into other rooms. They wait for the men to eat first. It is a 180-degree reversal of our society. Dinner was good: bread, yak milk (thick), potatoes, tomato and cucumber, and two healthy bowls of chai. I was taught how to say ‘thankyou’ in Kyrgyz: “Rachmad” [most inhabitants of the eastern Pamir are ethnic Kyrgyz]. At the end of the dinner, a prayer began, ending up with everyone saying “Allahu Akbar”. I was passively observing. Soon, they all stared at me, waiting. 3-4 seconds went past. Rashid prompted me, so I obliged out of social pressure: “Allahu Akbar”, I murmured. [I should add, this is utterly anathema to me. I am a fervent - though not dogmatic - atheist: a skeptic of many things, and certainly one of the supernatural. It felt silly professing that a non-existant entity is great, words that had never actually slipped through my mouth before. Though the alternative was offending my gracious hosts - it was an easy choice]. My utterance broke the stand-off. They all smiled, stood, and we went back to the car. Through the darkness, I talked with Omar, the taxi driver. He asked about kangaroos. I asked him about beards (which are banned in Tajikistan). We arrived in Murghab after midnight and Omar took me to his incredibly comfortable guest house for a well needed sleep. Murghab, Tajikistan: a quiet, treeless, somewhat soulless place. But a staging ground to the remarkable playground that is the Pamir. 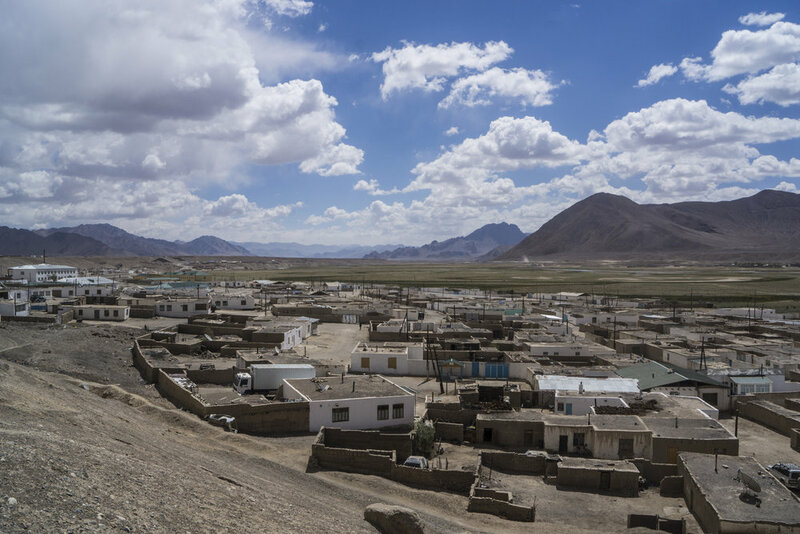 Murghab is one of those dusty little outposts that makes you wonder why anyone ever moved here. It's not for tradition or history: the town is a Soviet creation - a military outpost for the soldiers who must have been unbelievably poorly behaved to have been banished to such badlands. A notion I was quick to arrive at in Murghab was that there is nothing to do. Though [the day I arrived it was] the end of Ramadan, you could barely tell. People seemed locked in their homes. The only communal area appears to be a small bazaar. The bazaar is merely a series of rusty shipping containers that sell mainly non-perishable goods: bottled soft drink, chocolate, noodles. A rare burst of colour thanks to some fancily dressed youngsters. There are a litany of children all around. Most are friendly. One seemed agitated at me not giving him money, and started throwing rocks at me. The only colour in town is that of the women’s clothes - which are bright reds, purples and oranges, and are decorated with floral adornments and gold flake. The Murghab Valley is barren. It is a desert at 3600 meters. The sky here feels close - its various moods and oscillations feel within arms reach. As I walked around Murghab, I managed to negotiate a ride along the Panj River (the Tajik/Afghan border) all the way to Khorog, via the towns of Langar and Ishkashim. I was told this three day odyssey would cost only $100 - a steal for the Pamir. [Note: Every blog seems to describe how impossible and expensive it is traveling the Pamir - but I found the doomsdayism totally exagerated. There are plenty of drivers, plenty of traffic available for hitch-hiking if you so choose, and reasonable prices everywhere. The exaggerations are typical of the hyperbole you find it so many travel blogs. In truth, the Pamir is easy]. The proximity of Afghanistan presents me with a quandary: do I cross the border? I will, in effect, be within feet of Afghanistan's Wakhan, and have a strong feeling that my curiosity will best my logic. It is a safe region, but still comes with a modicum of unpredictability. I'm not sure if I want to cross the border for the right reasons: is it a my genuine curiosity, or some egocentric desire to be perceived as more adventurous than I really am? The truth, I presume, lies somewhere in between. In any case, crossing the border requires a visa. I may be able to acquire one in Khorog, a city of about 20,000 - the largest in the Pamir. If so, I will then have to back-track for half a day, cross the border at Eshkashim, and head to Afghanistan's Ishkashim, a few kilometers across the river from its Tajik namesake. In May 2017, Eshkashim successfully pushed back a Taliban offensive. Today, the Taliban are only 40-50 kms away [note: when I was in Afghanistan, I learned they were as close as 6 kilometers away]. And it's fighting season. Who knows what the situation is like on the ground? What I do know is that tourism in Eshkashim is BOOMING. And what a bizarre tale that is. If I can ascertain that it's a story worth telling, perhaps I will take the plunge. If so, I must not gloat - crossing into Afghanistan's safest region is hardly the act of an heroic war correspondent. Things, as always, are worth keeping in perspective. One of the more dystopian scenes during my time in Murghab.